The Gelug (Tib. དགེ་ལུགས་, Wyl. dge lugs) is one of the four main traditions of Tibetan Buddhism. It is the latest of the Sarma schools and was founded by the great Tsongkhapa (1357-1419) in the 15th century. Based on the Kadampa tradition founded by Atisha, it spread quickly through the activity of Tsongkhapa's many illustrious disciples, and eventually became the predominant school in Tibet, with major centres around Lhasa and in Amdo. Tsongkhapa's followers were first known as the Gandenpas or Riwo Gandenpas, after the monastery of Ganden, which he founded, and only later became known as Gelugpas—'the Virtuous Ones'. They also became known as the New Kadampas. Je Tsongkhapa Lobsang Drakpa, popularly known as 'Je Rinpoche', was born in the Tsongkha region of Amdo, East Tibet in 1357. Regarded as the living embodiment of Manjushri, and of Guru Rinpoche, he is also considered to have been the reincarnation of a young boy who offered a crystal rosary to Shakyamuni Buddha, and whom the Buddha predicted would be instrumental in the flourishing of the Buddhadharma in Tibet. Many prophecies about him can be found in the teaching of Buddha and later masters, including Padmasambhava. Receiving the first precepts from the fourth Karmapa, Rolpé Dorje, he was raised by a master of the Yamantaka Tantra, the yogin Döndrub Rinchen. By the age of seven, he was already engaged in advanced tantric practices, and at 16, he travelled to Central Tibet, where he studied all aspects of Sutras and Tantras with teachers of various traditions, including the great Sakya Lama Rendawa Shyönnu Lodrö and the Nyingma Dzogchen master Lhodrak Namkha Gyaltsen. He rapidly became an accomplished master of all the teachings he had received. Throughout his life, Tsongkhapa placed great emphasis on the need for study and practice and had no time for demonstrations of miraculous powers. Whilst he had many visions of Manjushri, who imparted to him secret Tantric teachings, he shared these with only a few advanced disciples. One of the particular features of his teaching was his insistence on pure moral conduct as the basis for successful spiritual training and development, and he gave an especially clear and detailed discourse on the Vinaya. To demonstrate his respect for the importance of discipline, he adopted the yellow hat, yellow symbolizing moral conduct, growth, and, being the colour of the earth element, the basis of everything. Through externally acting as a pure follower of Vinaya discipline, internally maintaining the Mahayana motivation of bodhichitta and secretly engaging in advanced Highest Yoga Tantric practices, Je Rinpoche exemplified the essential unity of the three yanas, and created an example and style of practice for his followers. Je Tsongkhapa undertook many long retreats. During one intensive four-year tantric retreat, he performed 3,500,000 prostrations and 1,800,000 mandala offerings, underlining the importance of the preliminary practices. On another retreat, he received a vision of Nagarjuna and his five chief disciples, and shortly afterwards gained direct realization on the ultimate truth, going on to write his famous 'Praise to Shakyamuni Buddha'. During yet another retreat he had a monthlong vision of all the masters of the 'extensive and profound' lineages from Buddha Shakyamuni to Atisha, and the chief masters of the Kadam lineage. After this he composed his Great Exposition of the Stages of the Path (Tib. Lam Rim Chenmo), one of the great classics of Tibetan Buddhist literature. Basing this work on quotations from the Sutras and commentaries, and using a format developed by Atisha, Je Tsongkhapa synthesized all of Buddha's Sutra teachings into a systematic and coherent scheme for study and meditation, which is still used as the backbone of practice by followers of the Gelug tradition today. He also wrote many works on Tantric practice, including the Great Exposition of Secret Mantra (སྔགས་རིམ་ཆེན་མོ་, Ngak Rim Chenmo). In all, he wrote 210 treatises, collected into 20 volumes. All along, Je Tsongkhapa emphasized the combined paths of Sutra and Tantra, and especially the uniting of the View of the Middle Way School with the practice of Anuttarayoga Tantra. Whilst he lived simply as a monk, his fame as a great scholar and meditator spread rapidly throughout Tibet and China. At the age of 52, he introduced the New Year 'Great Prayer' festival (Mönlam Chenmo) at Lhasa, and in 1409 founded the great mother monastery of Ganden. At first his followers were known as 'Gandenpas', and only later as Gelugpas—'the Virtuous Ones'. The anniversary of Je Rinpoche's passing away in 1419, the 25th day of the 10th month, has been celebrated all over Tibet and Mongolia, as 'Ganden Ngamchö'. There have been many well-documented accounts of miracles associated with Je Tsongkhapa. When the Chinese broke open the golden stupa which housed his tomb at Ganden, his preserved body was found to be still warm, with its hair and nails still growing. In Kumbum Monastery, at his birthplace, grows a tree the leaves and bark of which contain Tibetan letters and symbols. Tsongkhapa had hundreds of great disciples, but the two most famous and influential were Gyaltsab Darma Rinchen (1364-1432) and Khedrup Gelek Palzang (1385-1438). In 1416 Tsongkhapa's student Jamyang Chöjé Tashi Palden (1379-1449) founded Drepung Monastery, and in 1419 Jamchen Chöjé Shakya Yeshe (1354-1435) founded Sera Monastery. In the three monasteries of Ganden, Drepung and Sera, all near Lhasa and the largest in Tibet, the number of monks in the twentieth century is said to have been 200,000 (4,000, 9,000 and 7,000 respectively). 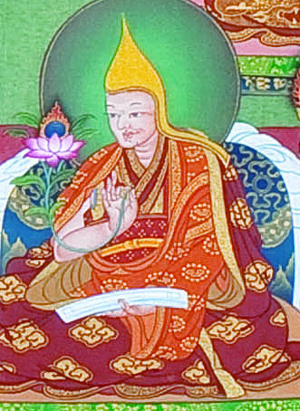 In 1440, Sherab Senge established the Gyümé Lower Tantric College in Lhasa, and in 1474, Kunga Döndrup, student of Sherab Senge and Gendün Drup, founded the Gyütö Upper Tantric College. Chamchen Chöjé established the monastery of Chamdo in Kham, in 1437. Je Tsongkhapa's disciple Gendün Drup (1391-1472), founded Tashilhunpo Monastery, near Shigatse, West Tibet in 1447, which accommodated 4,000 monks. 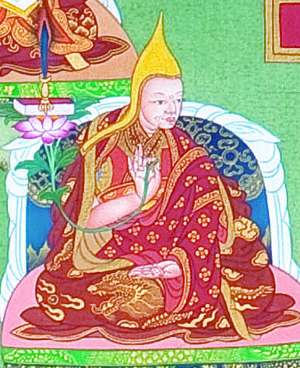 Gendün Drup’s reincarnation, Gendün Gyatso (1475-1542), made Drepung the centre of his study and teaching. When his incarnation Sonam Gyatso (1543-1588), as head of Drepung, met Altan Khan, chief of the Tumed branch of the Mongols, near the Kokonor in 1578, the Khan bestowed upon him the title 'Tale' (Dalai), meaning 'Ocean (of Wisdom)'. He was counted as the Third Dalai Lama. The Fifth Dalai Lama (1617-1682) brought about the pacification of the whole of Tibet under his direct rule, and did much to build up its stature. By the middle of the eighteenth century, the Gelugpa order had become the established unifying power in the land. The Gelugpa tradition is distinguished by its excellent standards of scholarship, and has produced countless extraordinary scholars and writers. These include—as well as the Dalai Lamas (who receive their main training in the Gelug tradition)—the Panchen Lamas, the heads of the Tashilhunpo Monastery. The First Panchen Lama, Chökyi Gyaltsen (1570-1662), an exceptional scholar, was the tutor of the Fifth Dalai Lama. Colleges of the great Gelugpa monastic universities tend to use different commentarial texts composed by their own scholars. For example, the works of Panchen Sonam Drakpa (1478-1554) are studied particularly at Drepung Losel Ling, Ganden Shartse, Gyütö and Ratö monasteries. The writings of Jetsün Chökyi Gyaltsen (1469-1544/6) are studied at Sera Je and Ganden Jangtse, and those of Jamyang Shepa, Ngawang Tsondru (1648-1721/2), are used extensively at Drepung Gomang College. The north-eastern province of Tibet, Amdo, was an important centre for spiritual activity and scholarship. At the birthplace of Je Tsongkhapa, in 1575, the Third Dalai Lama founded the monastery of Kumbum Jampa Ling, which accommodated 3,600 monks. Tashikhyil, established by Jamyang Shepa in Amdo in 1708 (or 1710? ), held over 3,300 monks, and produced many great scholars, such as Gungtang Tenpé Drönmé (1762-1823). Gönlung monastery was built in Amdo in 1592 by Dönyö Chökyi Gyatso. It was instrumental in the spread of Buddhism in Mongolia by the Changkya and Thuukvan incarnations. The Third Dalai Lama made two visits to Mongolia and the Fourth was born there, as the grandson of Altan Khan. The Kangyur was translated into Mongolian in 1628-9. In 1635 the First Jestün Dampa Khutukhtu, Lobsang Tenpe Gyaltsen (1635-1723), was born, the son of a Khalkha prince. Considered to be an incarnation of Jetsün Taranatha, he founded the Riwo Gegye Ling monastery and made his residence at Yeke Küriye, present-day Ulan Bator. He was a disciple of the Fifth Dalai Lama, and by his time the Gelugpa school became predominant amongst the Mongols. The Jetsün Dampas became the spiritual head of Mongolia. In 1717-20 the Mongolian Kangyur was printed in Peking and distributed throughout Mongolia, and between 1724 and 1729, the Tengyur translated and printed. A very influential figure during this period was the Second Changkya Khutukhtu Rolpe Dorje (1717-86). He was the teacher of the Emperor Ch'ien Lung, and his principal students were the Second Jamyang Shepa and Thukvan Lobsang Chökyi Nyima (1737-1802). In the 19th century, about 1,200 temples and monasteries existed in Inner Mongolia, and more than 700 in Outer Mongolia. There were also a number of Gelug monasteries in China. Before 1900 the number of incarnate lamas in the territories of the Mongols was 243. Mongolian students studied in great numbers in Tibet, and they produced some renowned scholars, the Mongolians having a particularly close connection with the Gomang College of Drepung Monastery. With the Chinese occupation of Tibet, many followers of the Gelug tradition went into exile in India. In Tibet almost all the Gelugpa monasteries were destroyed, with the exception of Tashilhunpo and Kumbum. Ganden was totally ruined, whereas at Drepung and Sera, some parts remained intact. In India, a number of Gelugpa monasteries have been re-established, especially Ganden, Drepung, Sera, Gyümé, Gyütö and Tashilhunpo. They are now thriving with a large number of young monks and traditional training and teaching continues. Through the efforts of various Gelug lamas and learned geshes, centres following Je Tsongkhapa's tradition have been founded in most countries in the West. For example, the Foundation for the Preservation of the Mahayana Tradition, an international organization of centres, was founded in 1975 by Lama Thubten Yeshe (1935-84), and is now directed by Lama Zöpa Rinpoche. The Gelug tradition stresses a deep and intensive study of the Buddhist scriptures. Philosophically, it follows the Prasangika Madhyamika viewpoint, and the tantras practised are Guhyasamaja, Chakrasamvara, Vajrabhairava and others, such as Hevajra, Kalachakra and Vajrayogini. In his monastic reforms, the Thirteenth Dalai Lama (1876-1934) established a formal 'geshe degree' programme of advanced training in the three great monastic universities, open to any monk. A Geshe is a master of the five major subjects of Buddha's teachings: Perfection of Wisdom (Prajnaparamita), Middle Way (Madhyamika), Discipline (Vinaya), Phenomenology (Abhidharma) and Valid Cognition (Pramana). The holder of the throne of Ganden Monastery, the Ganden Tripa, is the seniormost scholar and head of the Gelugpa School, and the direct successor Je Tsongkhapa. The route to the position of Ganden Tripa is a democratic one, as expressed in the Tibetan proverb: “if a mother's son has the right qualifications, then the Ganden throne is open to him”. Ringu Tulku, The Ri-me Philosophy of Jamgön Kongtrul the Great (Boston & London: Shambhala Publications, 2006), pages 123-127 & 164-166. Tulku Thondup Rinpoche, Buddhist Civilization in Tibet (New York and London: Routeledge & Kegan Paul, 1987), pages 61-66. This page was last edited on 20 July 2017, at 06:20.